The main criteria for listing on the PowderHandling web site is a genuine involvement in the Powder Handling & Processing Industry, as determined by PowderHandling. Companies who do not offer products or services specific to this industry cannot list. To submit your company for listing, please complete the form below and click the List My Company button. If your company meets this criteria then you can list on the directory for free, or you can enhance your listing for a small annual fee. We also have advertising & other sponsorship opportunities if you are interested in even more exposure. Product categories will be available for selection once your request for listing has been approved. Please note that your free listing only includes up to 5 product category listings. You can list under more categories if you upgrade your membership to a Bronze Level or above. Website links are not active with your Standard FREE Membership. 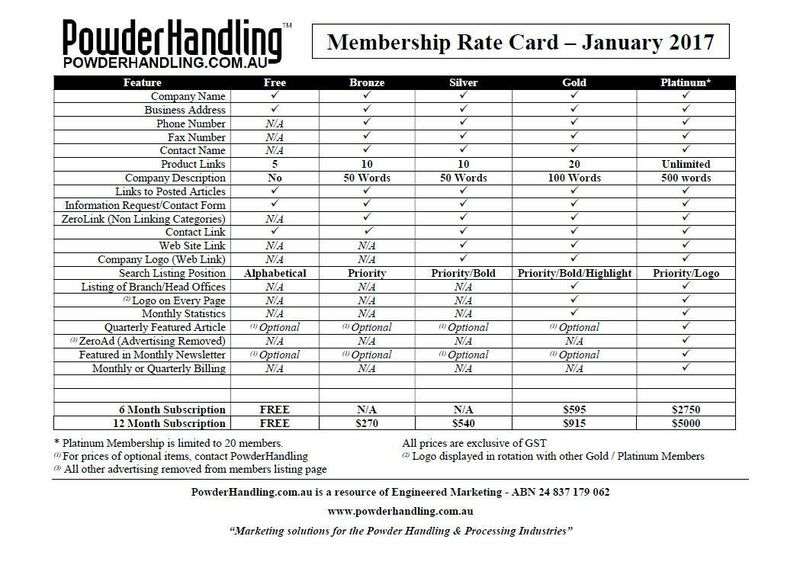 A list of membership levels, inclusions & rates is currently available here.